7th Rangers: So, Who Paid For S E Asia's Top Cops To Attend Fuzi's Daughter's Wedding? So, Who Paid For S E Asia's Top Cops To Attend Fuzi's Daughter's Wedding? 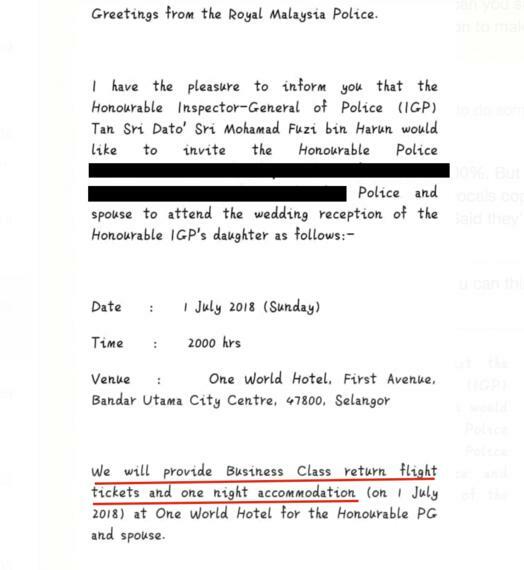 Sarawak Report : In the light of paperwork viewed by Sarawak Report it behoves Malaysia’s Inspector General of Police (IGP) to make a clear statement as to just who agreed to pay for the attendance of a swathe of Asia’s top cops invited to his daughter’s wedding on July 1st? The wedding itself was by various accounts lavish, but perhaps a career at the top of Special Branch and the Royal Malaysia Police Force enables sufficient savings to be made. What is provoking questions is a series of invitations that are understood to have been sent out to several of the IGP’s most senior counterparts in South East Asia from his official headquarters in Bukit Aman. Sent on the 6th April (a month before the election) the email is entitled “Wedding Reception of the Honourable IGP’s Daughter” and begins with the words “Greetings From The Royal Malaysia Police”. It then goes on to extend the invitation from Fuzi to the invitee and their wife* to the various high ranking police officers to the event being held at the One World Hotel in Banda Utama. Plainly, it is unusual and outside the normal rules for official staff (the Chief of International Relations, IGP’s Secretariat, Goh Boon Keng, signed off the letter) to be employed to extend such invitations to a private family event. However, the correspondence appears to have gone further still in that it states that “we” will provide Business Class return tickets for the police chief and his spouse, as well as a night in the swanky hotel.